On this post I’ll start a serie of posts talking about data structures implementations using Ruby. Some years ago I studied Data Structures but coding each one in C, I think C is a good language to learn because of pointers and struct, but implement in Object Oriented Language like Ruby is good for learn new concepts, plus I’ll use TDD to train and learn more about MiniTest (Because on my day/job I always use Rspec). 1.1 What is Linked List? Linked List is the simplest data structure in my opinion, it consist in set of information/data linked by pointer/link to the next data, the object/struct that stores the data if often called Node/Item. On this image we can see a list of nodes storing values linked by next_node arrow. But on this tutorial we’ll study doubly linked list that we’ll see below. 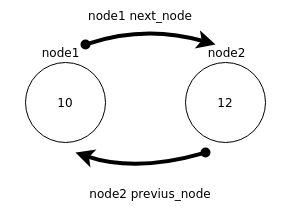 Doubly Linked List is the same as Liked List, the unique major difference is that doubly have one pointer to the next node and one to the previus. Now we have all the information that we need to start coding. Doubly linked list is a simple data structures project, we’ll create a gem that implements it. We’ll have two core classes, linked_list and Node. On this tutorial we’ll build our linked list in a gem like application, that’s why with gem we can easily build and use the list just including gem in our IRB/Pry session. After this, bundler will ask if we want to generate test with our gem, and if yes what gem we prefer, Rspec or Minitest, as I talked above on this tutorial we’ll use Minitest so just write ´minitest´ and press enter. Next all that ruby ask, you can say yes and everything will be ok.
After all steps you’ll see ruby creating our gem first files. If you already created a gem before you know what it is, is only the rubygems telling you that our description is not completed at file linked_list/linked_list.gemspec. Now let’s fix quickly this.. Open this file and replace the summary and description at line 12 and 13 for anything you want. After this, everything is ok, just run rake test and everything is ok for we start coding. Now that we have our gem created, let’s create our first class, this class we’ll be our node class. First of all let’s start with test, creating our test and writing the basic structure of a minitest test. Now, where to start? I like to start creating a test to assert that we can create our Node class. This error is telling that Ruby didn’t find Node class, to fix this let’s create our class and run test again. Run again your tests, finally we’ll get our test passing. Let’s create a test to assert that our node are storing and returning its attribute value. Run tests again, you’ll get the fallowing error telling that we sent one value to the node constructor and it was expecting 0. But.. Why is our linked list expecting 0? Because we don’t have a constructor yet, let’s do this. linked_list 0.1.0 built to pkg/linked_list-0.1.0.gem. And we’re creating nodes, but this nodes isn’t linked between each other, they’re just in our memory storing values. Now we need to create our links between each node, this links will be our next node and previus node, as you already know, let’s start with test. 2.4.1 :001 > require "linked_list"
Now with our previus_node and next_node we can link each node forming two interconnected nodes. Now if we run node2.previus_node ruby will return node1 and if we run node1.next_node ruby will return node2. We’ve finished our Node logic, now we need to start working on List logic. We created all Node logic and we’ve free way to start creating all list logic, but you can ask me, what’s logic? First Node, a method called .first_node to return the first node of the list. Last Node, a method called .last_node to return the last node of the list. Add Nodes, for this logic I want that our list have a method called .add(). Remove last node, create a .pop method, similar to Array#pop from Ruby. Remove first node, create a .shift method, similar to Array#shift from Ruby. Add first node, method called .unshift, similar again to Array#unshift. Print our list, I want a method that I can call with .print method and receive a graphical output on my terminal of my list. Starting from the beginning, we need to store the first node of our list in a var of our LinkedList class, I’ll name this variable head because this will be the “head” of our list. Starting from the test, let’s create a test that assert that we’re storing the head of the node when creating our list. This error is simple, is telling that we don’t have a class named List, to fix this just create List class. As we already know, this error is telling that we don’t have a constructor on our class, so let’s create it and test will pass. Note the use of attr_accessor, with this, the user don’t need to pass the node when creating list, and can write list.head = node, satisfying the second test. Now running our test, everything will pass, if you want you can install our gem and test this, everything will be working. We need to create a .add() method as I had described before… Starting from the test, what we need to test? I think a good point to start is asserting that we are calling the .add(value) method and we’re adding the new node at the end of the list (pointing the previus las node of th e list to this new last_node), and remember that if list is empty when we add node, this node will be the head node, on this test we’ve a lot of context but we’re not working with rspec so, we will write a lot of test. Starting from the beginning, we need to assert that inserting a node in a empty list, this node will be the head. Pay attention that this method will receive a value, not a node. Now, we need to create the .add(value) method in the list and asserting that if list is blank, the head needs to be the node created from the passed value, this will be easy, is just check if head is nil, if is nil, create a node with value and stores at head. self.head = Node.new(value: value) if head.nil? But, what’s problem with that method of find the last node? It’s that this method we’re passing between each node, and this is a O(N) algorithm (Don’t know what I’m talking about? Read my post when I tech Big O with simple approach here), ok O(N) isn’t a big problem with this example in image of four nodes but with a lot of nodes in our list, but with something like thousands of nodes it will be a problem. To solve this problem, we have a good solution in this case, it’s to create a last_node and everytime that we add a new node, we store it at last_node of the list, with this, when we add a new node, we check the current last_node of the list and stores the new node after this and set last_node of the list again, with this simple solution we will not have problems adding new nodes for any size of list. On this post we’ll follow this approach. Note that we’ll name last node of the list as tail. Creating the test and the method for the tail. (I’ll skip some steps here because is the same as head). Backing to our add method, let’s create the test. Running this test, obviusly it will fail, and now we need to complete our .add method, at this point we need to store the tail of our list. We have two context, one when list only have one node, this node will be the head and the tail of our list, and the second context when list have more than one node and we need to change the tail to the new node. I’ll comment the fallowing code to be more clean on my explanation, but please, don’t make your code with comments like these. self.head = new_node if head.nil? self.tail = new_node if tail.nil? Note that we created the new_node to have the same node in all parts. Run your test again and everything will be working, you can install your gem (as we done previusly) and test if you want. This method is very similar to .add but we’ll remove the last node, in Ruby we’ve a garbage collector so everything we need to do is to set de previus_node of tail as new list tail and set his next_node to nil. Implementing this in languages that doesn’t have garbage collector like C you’ll need to free the node that you’re removing. Starting from Test, it just need to assert that after .pop the new tail is the expected. Obviusly it will fail because we don’t have the method, creating the method, we need that this method picks the previus_node of current list tail and sets it as new tail, after that point his next_node to nil, pretty simple isn’t it? Again I’ll use comments but I repeat is just for learning purpose. Note that on the last line of the method I set old_tail.previus_node = nil to completely isolate it from the rest of the list, facilitating for garbage collector of ruby eliminate it. Run our test again and everything will pass, signaling that our .pop is complete. This method will be very similar to .pop but as I’ve described we’ll remove the head of the list. Everything we need to do is to set the next_node of the current head to be the new head! Just need to assert that after .shift the new head is the expected. Everything is the same, if you understand one, automatically you understand another. Run your test now and everything will pass. As I described, now we’ve to create the .unshift method. This method is very similar to .shift, but instead of move the head we’ll add a new head on the list. How we do that? It’s simple, we create the node that will be the new head and point his next_node to the old head, sets old head previus node to the new node and after this set list head as the new node, pretty simple. This test will be very simple, is just assert that after .unshift(value) our list head is this value. Running tests, obviusly it will fail because we don’t have .unshift() method created. Creating our method, it will be very similar, if you understand .shift and .pop you will easily understand this. If you run your test it will pass and if you want you can install your gem and test it by using. Note I’m not installing gem and testing each time we create a method because I’ll test everything on the final of post, feel comfortable to install and test if you want. As I described in the beginning of the chapter. This will be very funny and useful, it will help us use our list more easy and understand what is happening when working with the list. Just each node pointing to the next/previus by an arrow. Starting from the test, we need to create a test that assert the output of .print with a string of the expected output. assert_equal list.print, "10 <-> 20 <-> 30 <-> 50"
Pay attention that on head we dont have previus arrow, and at the tail we dont have next arrow. This solution is very simple, we pass between each array, stores and after this, joins with arrows. If you run your test it will pass. This solution is good and simple, I know that for this problem we’ve a lot of solutions and I’ll love to learn more, if you have another idea, please comment, but for this post we’ll continue with this. Another option is to include Enumerable module and pass between each node printing the arrows. Implementing a .each method, and after this including Enumerable module, we can have access to all power of Enumerable provide to us, it includes .each, .map, .select and much more. Don’t know what I’m talking about? I’ve made a post/tutorial explaining it, check out here. Add include Enumerable at the beginning of our class, and implement it each method. Ok, now everything we need to do is test, we already have .print method, so test, will be very funny. Installing our gem with rake install and opening our IRB and requiring our gem with require “linked_list” we can start playing with our project. And if we create our list, I should have nil head and tail. And now if we add something it should be the head and tail of our node. Fine, is working as expected, now let’s add a lot of nodes on our list. Now we have 6 nodes on our list, and this is perfect to test our print method. => "23 <-> 324 <-> 10 <-> 15 <-> 20 <-> 100"
Ok, print is working, now we need to test .pop, .shift, .unshift() and our bonus methods (Enumerable). => "23 <-> 324 <-> 10 <-> 15 <-> 20"
=> "324 <-> 10 <-> 15 <-> 20"
=> "10000 <-> 324 <-> 10 <-> 15 <-> 20"
We finished our tests, feel comfortable to test anything you want. And if you have any question please ask anywhere, you can comment this post, PM me on twitter or send me an email ([email protected]), I’ll love it!